VergeML is a command line based environment for exploring, training and running state-of-the-art Machine Learning models. It provides ready-to-use models, handles data preprocessing and augmentation, tracks your AI's training sessions and provides other goodies such as an automatic REST interface. VergeML runs on Windows, Linux and MacOS. You need to have Python 3.6 and TensorFlow installed. Congratulations, you have successfully installed VergeML! If you need further help, see the full installation guide. Let's create a very simple image classifier which tells apart cats from dogs. First, we create a new project for our classifier. Projects help you organize your data, save your training results and compare the performance between trained AIs. This sets up a model based on Keras called imagenet, which is based on transfer learning. VergeML will automatically create a samples folder and a configuration file (vergeml.yaml). Among other things, this configuration file defines the current model. In the output you will see a section on model functions. It says we have two model functions, train and predict. Let's try training first! After the download has finished, you will see a lot of images in your samples directory divided into two folders: cats and dogs. Later, when you use your own data, simply copy your images into subdirectories of the samples directory. VergeML will automatically pick up the directory names as labels. As a first step, VergeML will feed each of our images into a pretrained neural network, extract their features as output and cache it on disk. (On a GPU, this will typically take around 15 minutes.) Then it will train a new neural network based on this output. As a last step it will combine these two networks into a single network tailored for our task of classifying cats and dogs. This process is called "transfer learning". VergeML will print out the test accuracy after our training is finished to evaluate the model's final performance. Our cats-and-dogs classifier achieves 98.6%, which is pretty good. Info: By default, VergeML reserves 10% of your samples as validation and 10% as testing data. This step is required to measure the accuracy of your model. This will give you the name (prefixed by the @ sign) and several performance metrics. 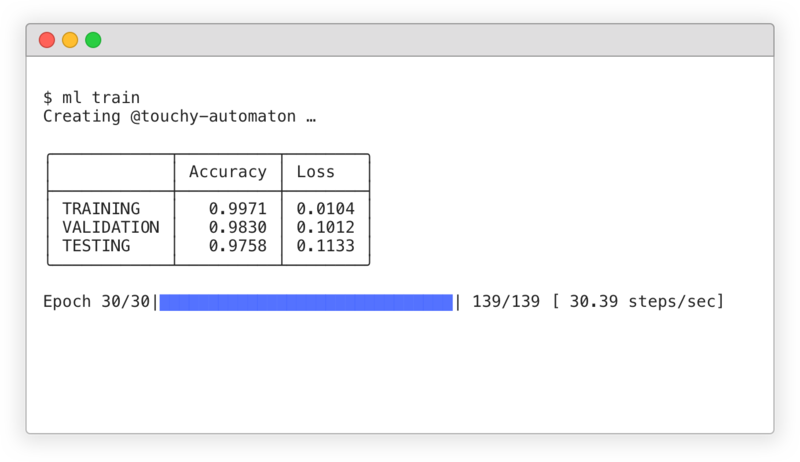 For instance, the training accuracy (acc) will tell you how good your AI can classify the images it sees during training, while validation accuracy (val_acc) tells you how well it performs with unseen images.